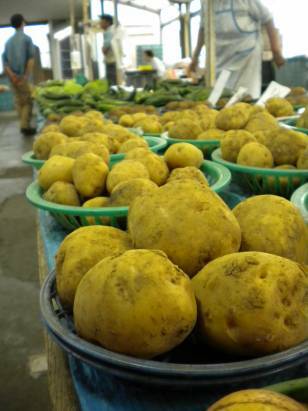 Kamakura Farmers Market potato bonanza! A very nice selection of markets this weekend awaits shoppers ready to brave whatever summer weather there is in store. Zucchinis will be coming to a close soon, so if those are a favorite you should consider heading out. Sweet peppers should be just coming onto the scene, and favorites such as tomatoes, beans, and cucumbers should still be going strong. Rumor has it that miyoga, moraheya, and a few other delightful vegetables should soon be arriving, too, but not just yet. The first few leaves of tsuru-murasaki, though, may be appearing, and that's something worth celebrating in itself. See you there!